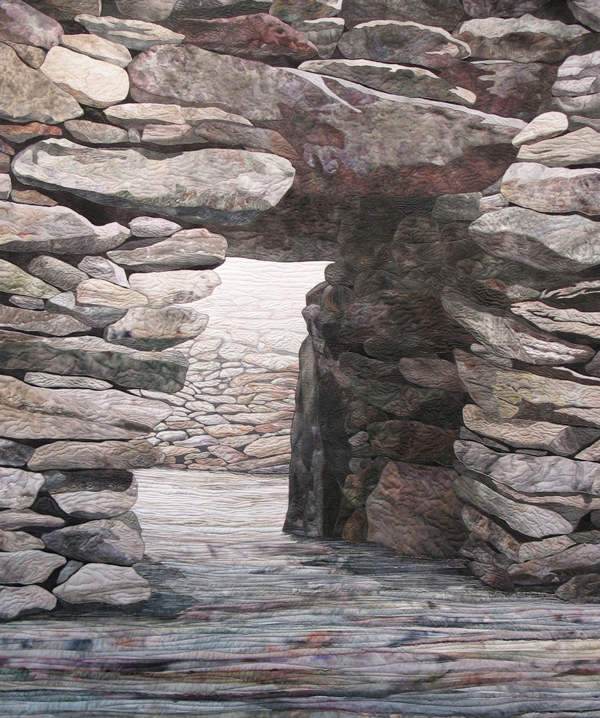 I make contemporary art quilts about non-contemporary objects – megalithic stones and ruins. I started off as a professional seamstress making custom women’s and children’s clothing. Not all that challenging after a time ­– the work was more focused on extreme craftsmanship than creativity. It certainly helped pay the bills. But it didn’t ever satisfy my lifelong desire to move into art. My many years as a seamstress, starting in 4H, gave me a love of working with fabric, it was a natural transition that my art be fabric-based. It’s what I wanted. It also let me focus on my images and messaging instead of having to worry about the actual mechanics and nuances of production. This very early and continuing focus on sewing technique resulted in a 2007 Quilt National McCarthy Memorial Award for Craftsmanship. 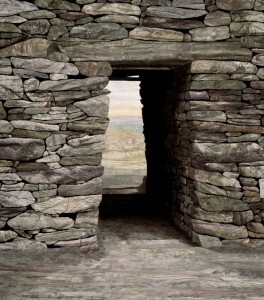 Those “other voices that beckon me” are those of (primarily Celtic) prehistoric stone monoliths – dolmens, standing stones and circles, and the like – or more recent monastic ruins, plus their landscapes. The stones are both immensely powerful and profoundly peaceful; they communicate age, belonging, permanency, the fervor of their creators. When around the stones, I feel an intense presence, a strength and timelessness not found elsewhere. And art quilts seem to be the perfect medium to communicate these many messages and emotions. My greatest reward is the often deeply emotional reactions people have to my quilts. This to me is the essence of art. I had no prior background in art. Knowing that I needed art-specific training, I developed and followed a deliberate plan to acquire this necessary knowledge. I attended design and art classes, primarily drawing and painting, along with classes in color, composition, and perspective (shadowing and perspective having always been my biggest artistic challenges). I also took classes in quilt making. I continue to take additional classes as needed. Although my stones are as realistic as possible, my landscapes and skies are deliberately abstract – this to provide needed context and a sense of place, while ensuring that the stones remain the focal point. Staying with the abstract also is more reflective of the intimacy, softness of light, and “near horizon” of the Irish landscape. I also focus on anything that helps create texture, including the use of my own fabrics and the couching of yarns, silks, and the like. My favorite techniques include fabric painting and the aggressive use of stripping (for my landscapes, and sometimes skies). Both of these techniques create unique blending of color and texture not otherwise achievable. And the finished product looks like Ireland! 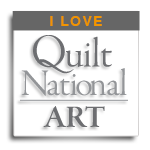 My biggest achievements include winning two Quilt National awards (including People’s Choice in 2007), and being successfully represented for the past five years by a top fine art gallery (which is not otherwise focused on quilting or fiber art) on Martha’s Vineyard. 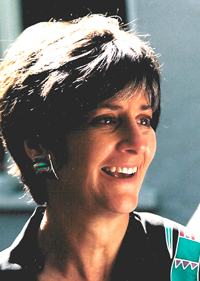 Finally, my mentors – first and foremost, above all others, has been my design group, including Patty Hawkins and Judith Trager as key long-time participants and influences. To me, honest and embraced criticism by artists from diverse media is a key element for artistic growth. 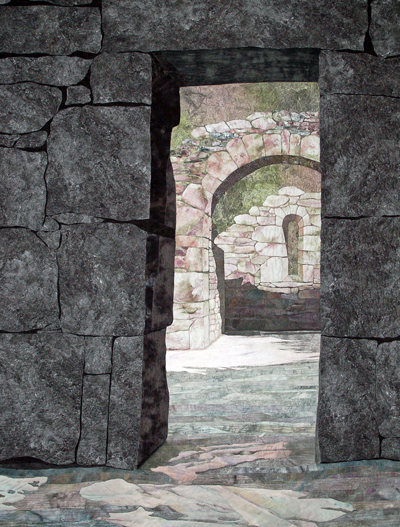 I’m not yet done with the quilting of my stonescapes – through my stones, I’ll continue to convey deeply emotional images of a human past largely forgotten. 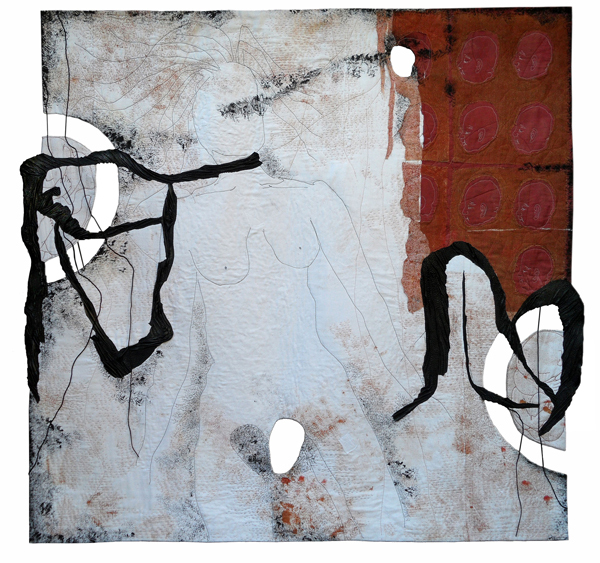 Denise is a contemporary art quilter, teacher, and lecturer. 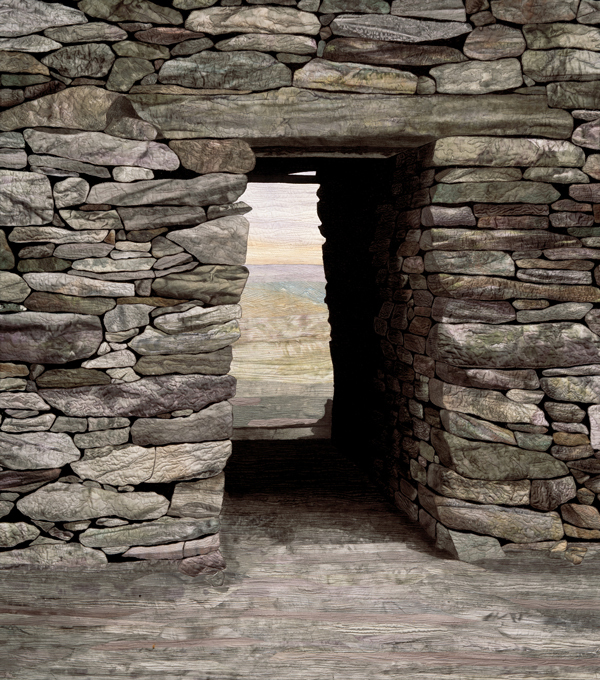 Her works are interpreted visions of either megalithic Celtic stone circles or standing stones, or more recent monastic ruins. She is currently represented by the Shaw Cramer Gallery on Martha’s Vineyard; her work can also be seen on her web site (www.labadiefiberart.com). 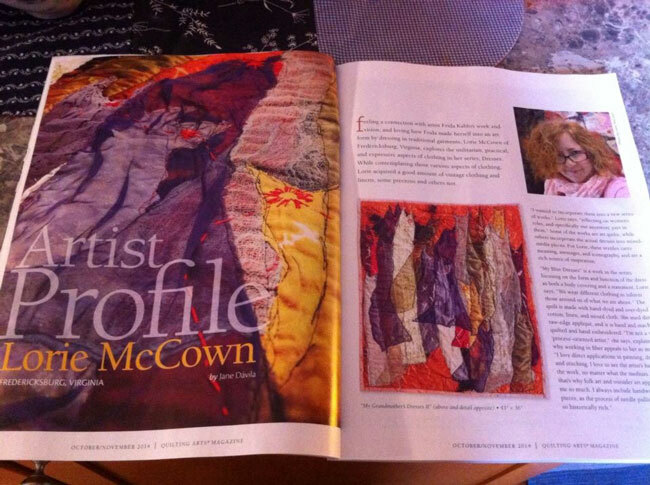 She lives outside of Boulder, Colorado, and focuses on her quilting full-time. 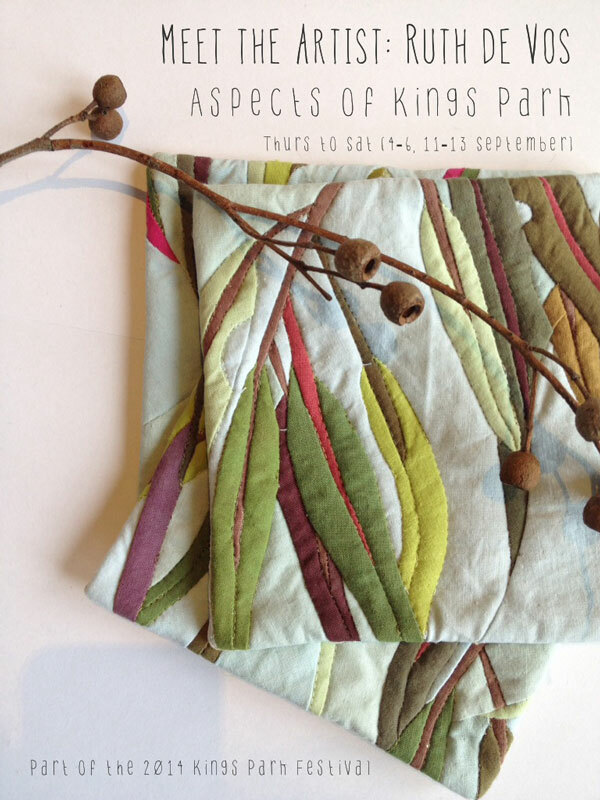 Ruth De Vos is showing a collection of her botanical textile art at the Aspects of Kings Park Festival (Perth, Western Australia) during the month of September. The Festival celebrates the wildflower season and is the perfect excuse for a day out in beautiful Kings Park. Pop in to Aspects, and then enjoy a coffee or lunch next door, after a leisurely walk through the beautiful parklands. There are a number of larger artworks on display, as well as more than 40 smaller artworks. De Vos will be in the gallery on Thursdays, Fridays and Saturdays for the next two weeks (4-6 Sept and 11-13 Sept), between 11am and 3pm, demonstrating the quilt making process.